Can I use COMPUSHIFT transmission controllers with a diesel engine? Yes. HGM supplies COMPUSHIFT with settings for both gas and diesel engines. Is it safe to piggyback a throttle position sensor (TPS)? Most engine control systems have their own throttle position sensor, and in most cases, you should use this sensor instead of installing a second one for COMPUSHIFT. Most engine control system / electronic fuel injection system makers don't recommend piggybacking sensors due to problems with ground loops and interference, but all COMPUSHIFT products are designed with a circuit called a differential amplifier that helps prevent these problems. Can I connect the tachometer output from my ignition system both the tachometer input to the COMPUSHIFT transmission controller and a tachometer gauge on the dash? Yes. This usually works just fine. How do I get the tachometer to work on COMPUSHIFT transmission controller on a diesel engine? Newer diesel engine control system's often have a tachometer wire, just like a gas engine. Older diesel engines sometimes have a tachometer wire that comes off the alternator. Often these are not quite the right speed, so you need a corrector to fix this. Alternatively, you can use a crank speed sensor like this one: Crank Speed Sensor.For many applications, you don't really need a tachometer input to the COMPUSHIFT system. It will usually run correctly without one, especially if the engine isn't a high performance gasoline engine. Do I need a laptop computer to program the system? No. All adjustments and programming to COMPUSHIFT can be done with the handheld display / programmer. Does the torque converter clutch (TCC) unlock during gear changes? On most transmissions and control programs, the torque converter clutch always unlocks during downshifts, and sometimes during upshifts, depending on the vehicle speed and throttle position. It is safe to upshift under light load while the TCC is locked, and most OEM systems do so. How do I run a speedometer with COMPUSHIFT transmission controllers? COMPUSHIFT provides an output signal for driving speedometers. This signal is called reproduced TOSS. This signal replicates the signal coming from the TOSS (Transmission Output Shaft Speed) sensor. This signal should be used when you have an existing OEM speedometer or engine control computer that uses the TOSS sensor. Reproduced TOSS comes off of the 25-pin connector and comes with enough cable to connect back to an original TOSS plug. A device called the Cable-X can drive mechanical speedometers if necessary. Built by Abbott Enterprises, the small Cable-X box motor rotates a speedometer cable at a rate proportional to an electronic speed input, and is calibrated to match your speedometer using internal switches. HGM is an authorized Cable-X reseller. How do I use an existing throttle position sensor (TPS)? A throttle position sensor usually has three wires: +5 volt power, ground, and signal. The power and ground wires supply a reference voltage to either side of a variable resistor. As the shaft rotates, the signal wire has a voltage that varies between +5 volts and ground. In order to connect COMPUSHIFT to an existing TPS, you only need to connect two wires, the ground wire and the signal wire. These can be piggybacked on top of the existing wiring using an in line wiretap, but they should be done as close as possible to the sensor. The +5 volt wire coming from the COMPUSHIFT should be left disconnected, but insulated to prevent a short circuit. How much does COMPUSHIFT cost? COMPUSHIFT prices are set on this website and by our dealers and representatives. You may purchase HGM transmission controllers, accessories and parts from this website or contact your nearest representative. A list of dealers can be found by clicking here. I don't understand the function of the "always upshift at" setting. What exactly does it do? I've installed COMPUSHIFT on a rebuilt GM transmission, but it doesn't shift correctly. What could be wrong? 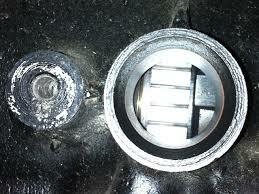 If the surface you see inside the hole is smooth, you'll have to break down the gearbox and install the toothed wheel. Despite the work involved, is a lot better to find this out before the transmission is in the car. My GM 4L60E / 4L80E transmission doesn't shift at all and / or the gear indicator shows "I" on screen. Though difficult, it is possible to plug the connector to the transmission in upside down. Be sure that the white line on the plug is facing up, not down. My GM 4L80E transmission doesn't shift at the right speed. The 4L80E has two speed sensors, one at the front (the input shaft speed sensor), and one at the back (the output shaft speed sensor). Make sure that the COMPUSHIFT speed sensor connection is connected to the rear speed sensor, not the front one. My COMPUSHIFT transmission controller is acting erratically. What could cause this? Poor wiring causes many of the problems we hear about. We have seen painted bolts used as frame grounds, 18-gauge wire used for power, and rat's nests of connectors in between. The solenoids and sensors in the transmission require a few amps of clean power to run properly. Make sure that you use soldered connections wherever possible. A dedicated connection to a switched ignition circuit is recommended. Occasionally, my COMPUSHIFT transmission controller shuts down entirely, but later restarts and works correctly. Why would it do this? The COMPUSHIFT transmission controller is a precision piece of instrumentation designed to handle the difficult environment of a car. However, it isn't designed to run under-hood or exposed to water, and it relies on some free airflow to provide cooling to the internal components. COMPSUSHIFT transmission controllers have a temperature sensor inside of the controller case and will shut down temporarily if safe operating temperatures are exceeded. Be sure to mount the controller inside the car, but away from the heater and heat from the exhaust system. What is the difference between PWM and non-PWM torque converter clutches? PWM stands for "pulse width modulation". In transmission control applications, PWM is a way of controlling a solenoid so that it applies varying amounts of hydraulic pressure according to computer control. PWM torque converter clutch systems use apply and release the clutch gradually to improve shift feel. Unfortunately, many of the PWM controlled systems cause the clutch to slip, and over time, eventually fail. Over time, manufacturers have introduced and then later removed this gradual apply / gradual release feature. Some types of transmissions have been built with both PWM and non-PWM versions of the converter clutch. For those transmissions, COMPUSHIFT has a setup menu selection that lets you choose PWM or non-PWM. Whether PWM or not, COMPUSHIFT always does a quick apply and release of the torque converter clutch. We feel that it is more important, especially in high-horsepower applications, to preserve the life of the clutch rather than improve shift feel. How do I mount the COMPUSHIFT II display in my vehicle? The COMPUSHIFT II display has a 1/4-20 bolt in the back that can be used to mount the display in the same way that a camera mounts to a tripod. A good source of mounts in RAM Mounting Systems.